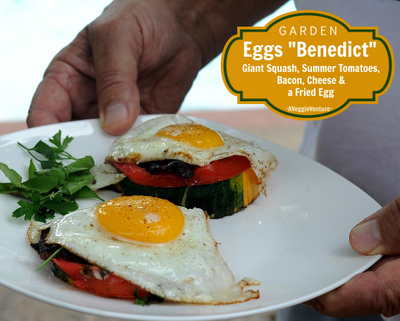 Today's tasty breakfast recipe, straight from the garden: It’s a garden version of Eggs Benedict. Low calorie. Low carb. Paleo if you leave out the cheese, primal if you leave it in. Weight Watchers friendly. Gluten free. Okay, so you’re right, of course. This isn’t really eggs benedict, because there’s no English muffin, no Canadian bacon and no hollandaise. Even the egg is fried, not poached. But that’s why I call it Garden Eggs “Benedict”. And it’s closer to traditional eggs benedict than you might think, given all that’s missing! It starts off with a slice of a large zucchini, a good way to use those "baseball bats” of zucchini that emerge from the garden this time of year. Then there’s a layer of warm tomato, isn’t it so good to have tomatoes again?! Crispy bacon is an easy substitute for Canadian bacon. If you keep the yolk runny, it makes a “sauce” that spills all over the whole pile once you dig your fork in. So phooey on the classic version, Garden Eggs “Benedict” is the summer’s best eggs benedict yet, straight from the garden. RECIPE for GARDEN EGGS “BENEDICT"
In an non-stick or well-seasoned cast iron skillet, heat a thin film of oil on MEDIUM HEAT. Leave the skin on the zucchini round, but score the skin all around, every half inch or so. Add the round to the hot skillet, it should sizzle a bit. Let gently cook about 5 minutes, then turn the zucchini over. Straight away, add the tomato layer, sprinkle with salt and pepper. Once the tomato is warmed, layer the cheese, fresh herbs and bacon. Let continue to cook, adjusting the heat so the zucchini doesn't get too soft or too brown. Add the cooked egg on top. That’s it! The thicker the zucchini round, the longer it will take to cook. We cook the bacon in a second skillet, wipe it out, then cook the egg in it too. For a crowd, you might want to make Baked Bacon. For the egg, you could poach an egg, this is how I Poach a Perfect Egg. Per serving: 204 Calories; 14g Tot Fat; 4g Sat Fat; 227mg Cholesterol; 368mg Sodium; 6g Carb; 2g Fiber; 3g Sugar; 13g Protein. WEIGHT WATCHERS WW Old Points 5, WW PointsPlus 5 CALORIE COUNTERS 100-calorie serving, just eat half but good luck with that. LOVE VEGGIES with YOUR EGGS? WE DO TOO! Walter ~ So nice to hear from you! Your eggs benedict sounds wonderful, isn’t it great to have our very own “house recipes”?! Jesse ~ Wow, thanks for the compliments! : -) You made my day! PS And I l-o-v-e recipes when I already have all the ingredients on hand! I just now (this very minute) stumbled across your blog and I cannot wait to try out this recipe and to go a-huntin' through your other ones!! For a low carb hollandaise: take 1/2 cup heavy cream and 1/2 cup unflavored almond milk bring to slow simmer over low low heat then take off of heat and melt some finely shredded cheese (Monterey jack) into it while the liquid is still hot. then add a little almond flour to thicken, scant amount of prepared mustard for a low carb version of hollandaise sauce. Eggs Benedict just happens to be my favorite breakfast. I'm lovin your summer version and I want crispy bacon on mine.